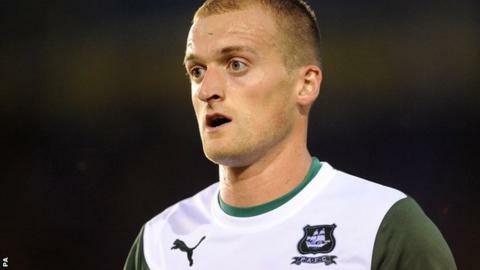 Promotion-chasing Plymouth held off a late Northampton fight-back to secure an away victory. The visitors took the lead when Peter Hartley headed in before Andy Kellett doubled their advantage with a finish from inside the area. Plymouth made it 3-0 when Lewis Alessandra struck from 12 yards. Substitute Ivan Toney pulled one back before Stewart Murdoch's long-range strike set up a tense finish, but Plymouth held on. "The last 10 minutes can't paper over the cracks. There's a lot of hard work needed. "I've made players available for loan and I'd be worried if I was some of them, because there have been hardly any enquiries. "I think sometimes I've been too nice to this group of players. They will all be in tomorrow at 8am." Match ends, Northampton Town 2, Plymouth Argyle 3. Second Half ends, Northampton Town 2, Plymouth Argyle 3. Attempt missed. Ivan Toney (Northampton Town) right footed shot from outside the box misses to the right. Attempt missed. Ivan Toney (Northampton Town) right footed shot from the centre of the box is close, but misses to the right. Delay in match Curtis Nelson (Plymouth Argyle) because of an injury. Attempt saved. Kelvin Langmead (Northampton Town) right footed shot from the left side of the six yard box is saved in the centre of the goal. Corner, Northampton Town. Conceded by Curtis Nelson. Corner, Northampton Town. Conceded by Peter Hartley. Goal! Northampton Town 2, Plymouth Argyle 3. Stewart Murdoch (Northampton Town) right footed shot from outside the box to the top left corner. Attempt missed. Emile Sinclair (Northampton Town) right footed shot from the centre of the box is high and wide to the right. Darren Carter (Northampton Town) is shown the yellow card. Goal! Northampton Town 1, Plymouth Argyle 3. Ivan Toney (Northampton Town) left footed shot from very close range to the centre of the goal. Anthony O'Connor (Plymouth Argyle) wins a free kick in the attacking half. Substitution, Plymouth Argyle. Tyler Harvey replaces Reuben Reid. Anthony O'Connor (Plymouth Argyle) wins a free kick in the defensive half. Corner, Plymouth Argyle. Conceded by Ben Tozer. Gregor Robertson (Northampton Town) wins a free kick in the defensive half. Substitution, Plymouth Argyle. Jason Banton replaces Lewis Alessandra. Attempt missed. Ivan Toney (Northampton Town) header from the centre of the box is close, but misses to the right. Attempt saved. Lewis Alessandra (Plymouth Argyle) left footed shot from the right side of the box is saved in the top left corner. Foul by Oliver Norburn (Plymouth Argyle). Attempt missed. Ivan Toney (Northampton Town) left footed shot from outside the box is high and wide to the right. Goal! Northampton Town 0, Plymouth Argyle 3. Lewis Alessandra (Plymouth Argyle) left footed shot from the centre of the box to the bottom left corner. Assisted by Reuben Reid. Foul by Stewart Murdoch (Northampton Town). Substitution, Northampton Town. Lawson D'Ath replaces Oliver Banks. Lee Collins (Northampton Town) wins a free kick in the attacking half. Attempt missed. Oliver Banks (Northampton Town) left footed shot from outside the box is high and wide to the left.